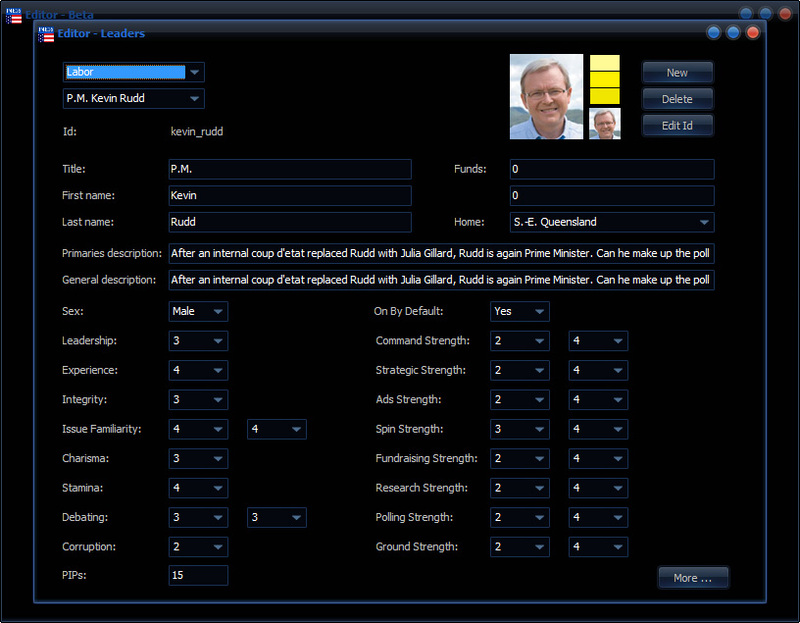 Prime Minister Forever – Australia 2013 will feature the latest game engine, and include an editor that allows for editing and creating leaders, parties, surrogates, endorsers, and percentages (and probably more – a first for a Prime Minister Forever game!). 2nd time lucky for Leader of the Opposition Tony Abbott? Editing P.M. Kevin Rudd’s attributes. Just about to download; if it’s anywhere near the quality of President Forever 2016 then this will be fantastic (especially as an Aussie). Sorry I’m a bit confused- it doesn’t seem to be available atm. When can we get it as an update? P4E16 and PM4E Aus 2013 are based on the same game engine – note that the latest Beta isn’t the latest internal – that will probably be released next week. I know this would be a fairly long-into-the-future project but do you have any plans to create a British game on this engine? It would work very well I think as seat targeting is a huge deal and many would also be pleased to see raw vote totals in individual seats. Maybe – right now the focus is on getting PM4E Aus 2013 done, then P4E16. Not making any commitments beyond that at this point. The last British game was fun but it crashed sooner or later in nearly every scenario so I had to give up eventually. How many scenarios will contain the game? Will the campaign and election results be “Two-party-preferred vote” system? Because PM4E Aus 2013 uses the latest game engine, crashes that might have occurred in the British 2010 game won’t occur. At first, the game will contain 2013, and we will focus on that until after the election. Afterwards, it might be expanded to include more – no promises for now. 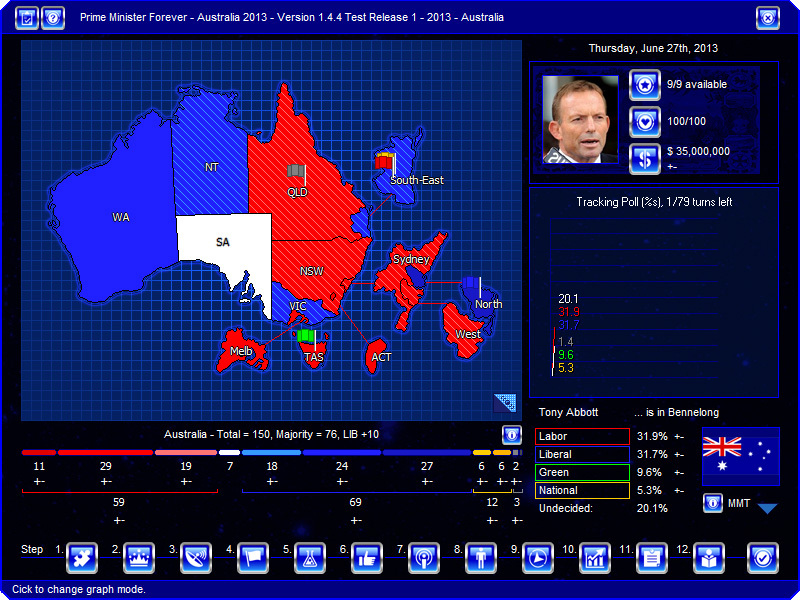 Yes, PM4E Aus 2013 will include 2PP. I can certainly see that. This new engine is the job and well done to the players as well for reporting what bugs were there. So when is it available for download exactly? New Beta should be released tomorrow, assuming no major bugs discovered between now and then.